The election of 1927 had left the Conservatives with only nine mlas. 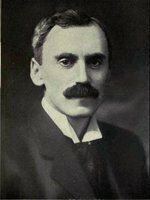 During the party’s convention on 9 and 10 July 1929, its head, Arthur Sauvé*, whose leadership was challenged by the rank and file, resigned and was replaced by Camillien Houde, the member for Montréal-Sainte-Marie, who was acclaimed. 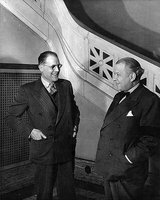 Houde, who had just become mayor of Montreal, was a rising star. Duplessis knew that Houde would be too undisciplined to be anything other than a shooting star in the sky of the capital: he would wait his turn. The two men were to be rivals for more than a decade. 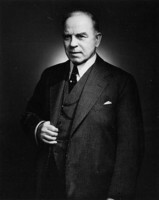 In the general election of 24 Aug. 1931, held in the midst of the Great Depression, the Conservatives managed to add only two members to their caucus, despite getting a larger share of votes than in the previous election; even Houde lost his seat. 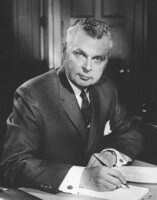 He and Thomas Maher, an active Conservative supporter, wanted to contest the elections of 63 Liberal mlas. Duplessis, who had taken his riding by 41 votes, was one of the dissident members who did not want to risk having their own elections overturned, and he was criticized for his reluctance by his leader, Houde. Taschereau had the rules governing the judicial contesting of elections changed by legislation known as the Dillon act and frustrated the Conservative plan [see Henry George Carroll*]. 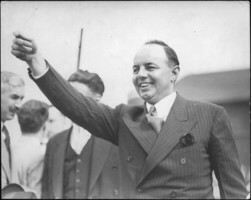 Defeated in the Montreal mayoralty race on 4 April 1932, Houde resigned as leader of the Conservative Party on 19 September. On 7 November some Conservatives met in caucus and chose Duplessis as leader of the opposition over Houde’s hand-picked heir apparent, Charles-Ernest Gault. During this short session, Duplessis established an old-age pension program in conjunction with the federal government (something the Liberals had been rejecting since 1927, but had agreed to just before the election), and he introduced several amendments to the electoral law and the law on workplace accidents. Relieved of the reform wing of his party, he turned his back on radical policies such as nationalization of the electric-power companies and adopted a liberal approach that differed little from that of his predecessor. About corporatism he said not a word. One of the most striking measures of his first term of office was the Act respecting communistic propaganda (or Padlock Law), given royal assent in 1937, following a campaign launched by Cardinal Jean-Marie-Rodrigue Villeneuve* the year before. It was a measure intended to exploit the insecurity of the populace during that turbulent period. Applauded at first by the Catholic labour organizations, it would, in the end, constitute a threat to the trade-union movement: any place being used for the propagation of communism or Bolshevism could be condemned by the attorney general. The year 1937 set the tone for relations between the unions and Duplessis, whose most progressive step was the creation of the Fair Wage Board. It was not well received, however, by the trade-union movement, which preferred collective bargaining to the arbitration process set up to establish a minimum wage. In addition, Duplessis prohibited the closed shop (in which workers must belong to a designated union to be hired) and he exempted public works carried out for the government from the provisions of the Fair Wages Act and the Act respecting the extension of collective labour agreements (given royal assent in 1934). Moreover, he gave the government the right to revise agreements that had been extended by decree to an industrial sector. 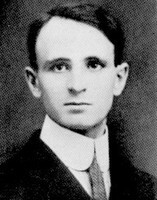 Last of all, that year Duplessis and his minister of labour, William Tremblay, intervened in the strike at the Dominion Textile Company Limited, ordering the workers to return to their jobs before negotiating. The government called in the provincial police in the shipyard workers’ strike in Sorel (Sorel-Tracy). The fight against federal encroachment was not Duplessis’s only battle. 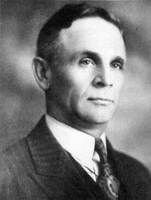 On 4 Dec. 1946 he had the liquor licence of restaurateur Frank Roncarelli cancelled. A Jehovah’s Witness, he was posting bail for his co-religionists arrested for various infractions of municipal regulations; once released, they resumed their campaign against the Roman Catholic Church, much to the annoyance of clergy and the public. Roncarelli launched a suit against Duplessis that would end in a Supreme Court judgement on 27 Jan. 1959 in the restaurateur’s favour, but not without enhancing the Chief’s popularity. On 16 Feb. 1948 the provincial police invoked the Padlock Law to close the premises of the Labor-Progressive Party’s Montreal weekly, Le Combat. 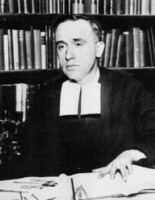 The Supreme Court would declare this legislation unconstitutional on 8 March 1957, putting an end to Duplessis’s crusade against the communists [see Francis Reginald Scott*]. The premier would, however, benefit until the end of his term in office from the favourable political fallout of a related matter that touched the sensibilities of Catholics and anti-communists: the Polish treasures from Wawel Castle in Kraków that had been kept out of Nazi hands. 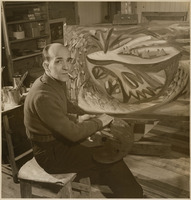 In 1948 Duplessis had them brought to the Musée de la Province in Quebec City, and he steadfastly refused to turn them over to the Polish communist government. For the time being, the unions were emboldened by this retreat of the premier, who would soon be confronted with a historic labour dispute. Le Devoir had just published a series of articles on the ravages of asbestosis, a disease affecting asbestos miners. A few weeks later, a strike broke out at Asbestos and at Thetford Mines. The workers called for higher wages, a healthier workplace, and automatic union dues check-off. They also wanted a voice in management, one of the recent demands made by the Catholic unions. 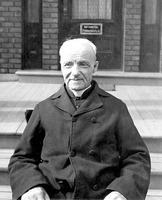 Duplessis had no intention of letting the workers oppose employers’ proprietary rights with this new principle of labour relations. In the field of labour relations, Duplessis had got the powers of the Labour Relations Board amended in 1954 through the adoption of Bills 19 and 20, which gave it the authority to refuse certification to unions whose executives included communists and to those favouring strikes in public services. It was a move that brought union members out into the streets once more. This time, unlike the occasion in 1949, Duplessis did not flinch. The episode – and the 1957 seven-month strike in Murdochville, which was marked by confrontations between workers and police – showed that nothing had changed between Duplessis and organized labour. Despite these controversies, Duplessis was ready to go to the polls in 1956. Armed with a work by the nationalist historian Robert Rumilly*, Quinze années de réalisations: les faits parlent, published that year in Montreal, he boasted not only about his victory over federal centralization, but also about his accomplishments, including amendments to the Youth Protection Schools Act (1951), the Act respecting the regulation of rentals (1951), the founding of the Université de Sherbrooke (1954), and the establishment of the Quebec Agricultural Marketing Board (1956). On 20 June 1956 he and his party were re-elected with a slightly higher majority: 72 seats against 20 for the opposition. With 44.9 per cent of the vote, compared to 51.8 per cent for the Union Nationale, the Liberals were forced to recognize that they had been badly served by their pro-federal position in the debate on provincial autonomy. However, this election ushered in a period of disfavour, indeed decline, for Duplessis and his party, who would propose nothing new apart from an increase in prospecting in the Nouveau-Québec region to the benefit of American companies that would pay meagre royalties to the province. The electoral methods used by Duplessis were brought to light in July 1956 by Abbés Gérard Dion* and Louis O’Neill*. In an article originally intended for the clergy but later widely disseminated (notably by Le Devoir on 14 Aug. 1956 under the title “L’immoralité politique dans la province de Quebec”), they accused the Duplessis regime of corrupting the electoral and political systems, extorting money from businesses and entrepreneurs, stealing the votes of some voters, and buying the tacit consent of the clergy by supporting its charitable works and playing the card of anti-communism. The eruption of the natural-gas scandal in June 1958 proved that Duplessis was beginning to lose control of his troops. Several ministers in his government were said to have purchased blocks of shares in the Quebec Natural Gas Corporation before the sale of the gas network was made public, and thereby becoming guilty of insider trading. The affair would drag on past the end of the Union Nationale government. The commission under judge Élie Salvas, established in 1960 by the government of Jean Lesage* to investigate the scandal, would also uncover the system of government purchasing controlled for the benefit of the Union Nationale by Gérald Martineau and Joseph-Damase Bégin*, respectively then a legislative councillor and a minister. 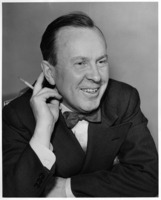 Duplessis, with the characteristic style that so pleased voters, declared on 1 June 1959, according to his biographer Robert Rumilly, “No one loves the province of Quebec more than the man who is speaking to you.” Indeed, Duplessis cultivated his populist image, both in his appearance and by his attitude. On 3 Sept. 1959, after visiting iron mines on the north shore of the St Lawrence region, the man who had been premier for more than 15 consecutive years died of a cerebral haemorrhage in Schefferville, in a cottage belonging to the Iron Ore Company of Canada, early on the morning of 7 September, Labour Day. He was succeeded by his heir apparent, Paul Sauvé, who prepared for an election campaign on the theme of change. But Sauvé himself died on 2 Jan. 1960, at the end of what the press dubbed the “100-day revolution.” It was Antonio Barrette who led the ranks of the Union Nationale to defeat at the hands of Lesage’s Liberals on 22 June 1960. The principal manuscript sources concerning the life and work of Maurice Le Noblet Duplessis can be found at the Arch. du Séminaire Saint-Joseph de Trois-Rivières, Que., 0019 (fonds Maurice L. Duplessis), the institution where he did some of his studies. 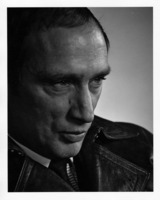 This collection provides evidence mostly for his political career between 1927 and 1959. Before being made available to the public, this fonds was held for 30 years by the Société des amis de Maurice L. Duplessis Inc. Auréa Cloutier, Duplessis’s private secretary even before his political debut, assumed responsibility for its classification. She allowed three of his biographers, Robert Rumilly, Conrad Black, and Bernard Saint-Aubin, access to the fonds. Moreover, nine rolls of microfilm, containing copies made by Black, can be found at the Bibliothèque et Arch. Nationales du Québec, at the Centre d’arch. de la Mauricie et du Centre-du-Québec (Trois-Rivières) and the Centre d’arch. de Québec (where the fonds Maurice Duplessis are numbered respectively ZC9 and ZC44), and at York Univ. Libraries, Arch. and Special Coll. (Toronto), F0303 (Maurice Duplessis fonds). The Univ. of Windsor Arch. (Windsor, Ont.) also holds material on microfilm: 96-024 (Maurice Duplessis fonds). The following work is useful for those seeking an introduction to the various historical interpretations: Duplessis: entre la grande noirceur et la société libérale, sous la dir. d’A.-G. Gagnon et Michel Sarra-Bournet (Montréal, 1997). Finally, many political science and sociological studies about Duplessis’s society and regime, including countless contemporary accounts, have been published. They can be found by consulting Michel Lévesque, L’Union nationale: bibliographie (Québec, 1988). Bibliothèque et Arch. Nationales du Québec, Centre d’arch. de la Mauricie et du Centre-du-Québec, CE401-S48, 21 avril 1890. La Patrie (Montréal), 8 sept. 1959. Michel Sarra-Bournet, “DUPLESSIS, MAURICE LE NOBLET,” in Dictionary of Canadian Biography, vol. 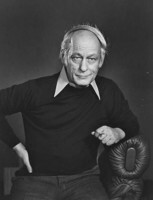 18, University of Toronto/Université Laval, 2003–, accessed April 20, 2019, http://www.biographi.ca/en/bio/duplessis_maurice_le_noblet_18E.html.